Forrest Potter with his younger brother Bryson Potter. Bryson was diagnosed with Leigh Syndrome (LS) as a child, a progressive neurodegenerative disorder. Forrest Potter grew up at Seattle Children’s watching by the bedside as his little brother faced a debilitating diagnosis, Leigh Syndrome (LS), a progressive neurodegenerative disorder. Nearly 17 years after his brother’s diagnosis, Potter hopes to once again find himself by the bedside, this time wearing a white coat. When he was younger, there was little he could do for his brother. Today, he’s hopeful he’ll be able to help those in need and that his experiences at Seattle Children’s will help him as he begins a medical journey of his own. Kai was first seen at Seattle Children’s Craniofacial Center when he was 5 months old. Samantha Alexander first met Dr. Emily Gallagher, a craniofacial pediatrician in Seattle Children’s Craniofacial Center, when Alexander brought her 5-month-old son, Kai, to the clinic. Kai’s primary care doctor thought plates in his skull had fused together too quickly. He was evaluated for a metopic ridge, creating a point on his forehead. But from that initial clinic appointment, Alexander and Gallagher bonded over an unlikely love: children’s books. After the appointment was over, they chatted about their favorite books for nearly 30 minutes. Alexander was an elementary school teacher before moving to Seattle with her husband, DJ Alexander. They moved in 2017 when DJ, a professional football player, was traded to the Seattle Seahawks. She had given up her teaching career, but she held fast to her love of books. During that first appointment, Gallagher brought up a program called Reach Out and Read, which gives books to children 6 months to 6 years old during well-child visits. Gallagher started the program in the Craniofacial Center as a novel program outside of primary care. 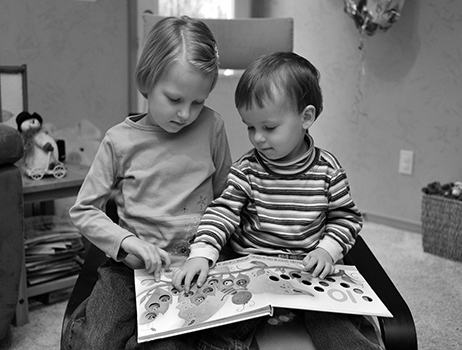 In the Craniofacial Center, pediatricians encourage families to read aloud together as a way to promote language development, with an additional focus on children with craniofacial differences who may face additional challenges with speech. Although Alexander’s son was too young for the program at the time, she says she instantly knew she wanted to help Gallagher expand the program. Jenna and Braden Westerholm play together. Braden lost his sister to rhabdomyosarcoma in 2009. In February 2006, Chris and Michele Westerholm’s 2 1/2-year-old daughter, Jenna, was diagnosed with rhabdomyosarcoma – a cancer made up of cells that normally develop into skeletal muscles. At the time, Michele was 11-weeks pregnant with her son Braden. Dr. Jane Buckner of the Benaroya Research Institute at Virginia Mason and Dr. David Rawlings at Seattle Children’s Research Institute are leading research to develop an immunotherapy for type 1 diabetes. Advances in engineering T cells to treat cancer are paving the way for new immunotherapies targeted at autoimmune diseases, including type 1 diabetes. Now, researchers are also investigating therapies that reprogram T cells to “turn down” an immune response, which may hold promise for curing type 1 diabetes, as well as a number of diseases where overactive T cells attack a person’s healthy cells and organs. “Instead of stimulating the immune system to seek and destroy cancer cells, treating autoimmune conditions will require programming a patient’s own T cells to tell rogue immune cells to calm down,” said Dr. David Rawlings, director of the Center for Immunity and Immunotherapies at Seattle Children’s Research Institute and chief of the Division of Immunology at Seattle Children’s Hospital.